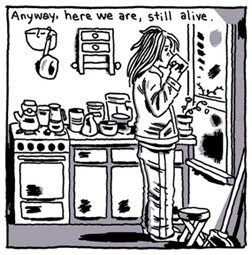 A panel from Gabrielle Bell's story, "Brooklyn". In this dazzling episode, The Claptrap crew talk to the delightful and insightful cartoonist, Gabrielle Bell, who discusses her latest adventures of bringing new "Lucky" comics to the Internet! We also do some cartoonist impressions, talk about Swedish comics, share vitamin water with our always-ecstatic New Comics reporter and cartoonist Josh Frankel. Oh, and as requested, we've shortened the podcast down to *almost* an hour -- trimming some of the fat just in time for Spring!! This is the part of the show when we make the guest as uncomfortable as possible by trying talk them into dating a possibly obsessive fan. Hey so did The Comix Claptrap quit the internet, too?